In music there’s occasionally a tension between “tradition” and “progress.” Some people who are accustomed to seeing a genre or style performed a certain way want to see things stay that way and view any change to that as detracting from the quality of the music, or worse- an affront to their deepest core beliefs. While this occurs in nearly every genre (Rock, Jazz, and Metal are all rife with purists of every variety), few see the debate get as heated as it does in country music. Though this conversation has been going on as far back as the music itself (Read: a long time), it rages particularly strong at the current moment, with country traditionalists lambasting many popular contemporary country singers. Both sides make good points in this argument- innovation helps the music stay current, culturally relevant, and interesting, while at the same time it can be hard seeing something you love change. Despite this seemingly perpetual tension, however, every once and awhile an artist or band comes around that everybody can agree upon, an artist who moves things forward while respecting the established traditions of yesteryear. One such artist who’s been making waves in certain circles is Nashville’s Joshua Hedley, the opening act for Old Crow Medicine Show’s Concert at the Palace last Friday. Hedley, originally from Florida, was touring behind his brand new record, Mr. Jukebox, a neo-traditional country record that captured some of the best elements of classic (which in this case means 1960’s) country, while maintaining a sensibility that kept it from feeling overly nostalgic. The set stayed true to form, with his band (named, ironically, “The Headliners”) effortlessly churning out one traditional sounding country song after another. In the set’s best moments, Hedley and the band were referential without sounding cheesy or pandering too much. At one point, Hedley even referenced a classic Blues Brothers scene by saying that they played “Both country And western.” It wouldn’t be the only humorous moment of the set, as he remarked that the excellent “Let’s Take a Vacation,” which had just recently been covered in Rolling Stone, could be called the “Feel bad hit of the summer.” There is some truth to this, of course, as many of the songs were sad in one way or another (this is traditionalist country music after all), but Hedley and his band gave them life in a deeply felt way that engaged the growing audience rather than alienating them or bumming anybody out. Particularly strong were the timeless sounding “Counting All My Tears,” the harmony-laden “Don’t Waste Your Tears,” and the set-closing cover of “When You Wish Upon a Star.” It wasn’t the rowdiest set in the world, but the audience took a liking to the strong batch of songs that Hedley had to offer. Only time will tell how his career plays out, but it’s already clear that he has the talent and taste to make a splash in Nashville and beyond. 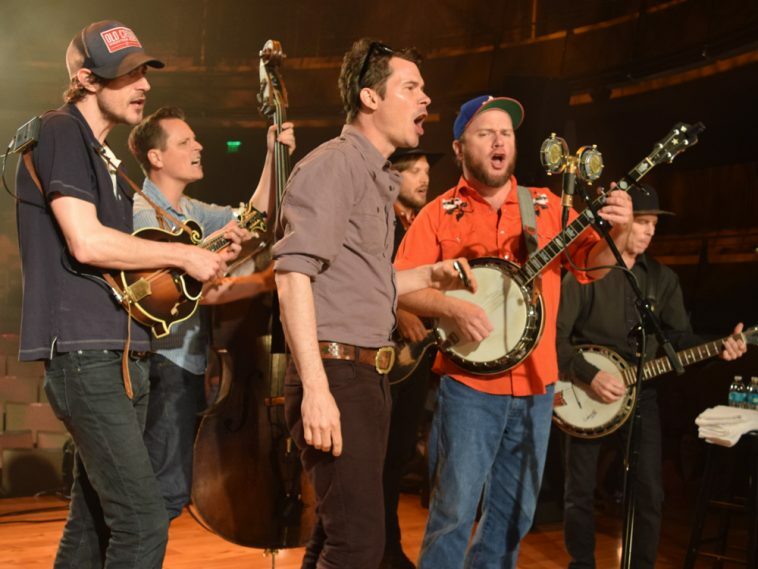 Though not a “country” band according to the strictest definitions, Old Crow Medicine Show also has an interesting, albeit different relationship to tradition than the band that took the stage first. They play old-time music, and bluegrass, and infuse it with elements of other genres, including country and rock. If I had to label it something, I’d call it “Alternative Bluegrass.” Regardless of how you categorize them, Old Crow is a force to be reckoned with. This was apparent throughout their show, which saw the genre-bending band effectively play every type of fast song, many types of slow songs, and everything in between. Opening with “Child of the Mississippi” from their new album, the acclaimed Volunteer, the band quickly dispelled any doubts that they’ve lost a step after 20 (!) years on the road. The song was well written, well paced, and went over well with the audience, even if it wasn’t the flashiest song they’d play during their set. Up next was the rowdy “Alabama High Test,” from my favorite album, 2008’s Tennessee Pusher. It pushed the pace even further, and, along with “Take ‘Em Away,” was an early showcase of the stellar musicianship that would be on the stage that night. The energy would only pick up from there, with “Shout Mountain Music,” and another instrumental both proving to be uptempo highlights before the (relatively) slower “Dixie Avenue.” By this point, nearly everyone in the band was on a different instrument than the one on which they started. This, to say the least, was impressive. The show moved along, one well-placed and well-paced song after another, drawing from every part of there catalog, and pushing every boundary they confronted in the process. Of particular interest to me was the one-two punch of “Sweet Amarillo,” from 2014’s Grammy-winning Remedy, which was a big singalong moment, and another Tennessee Pusher cut in “Caroline,” the latter of which they slowed to a crawl, which gave the song a drastically different feel from the album version, and most of the other songs they’d played in their set up to that point. After their version of “C.C. Rider” (a standard they recorded on their 2004 debut), the set got even more interesting. Sit-ins are inherently risky propositions. Any time you bring musicians together on stage, there’s a chance that the chemistry won’t be there on a given night, or generally, that something will go wrong and it’ll fall flat. In my day I’ve seen too many sit-ins that end up being ‘meh’ or worse. This show featured two excellent sit-ins. The first saw Hedley welcomed back to the stage to cover a country song. This should come as no surprise, but their choice of country song was excellent. It was Glen Campbell’s 1968 smash “Wichita Lineman.” Perhaps I’m biased (it is, after all, one of my favorite country songs), but I found the cover to be well done. After a few songs performed around a single microphone (“Opry Style,” they called it), they brought out another guest, Keith Secola, whose appearance was a bit more surprising than Hedley’s. Secola, an Ojibwa singer-songwriter from Clay County, came on and sang two originals, including the stellar “Indian Cars.” In the band’s introduction, they talked about their long relationship with Secola, and this showed in there chemistry on stage. Both songs went over well, and it was pleasantly surprising to see how smoothly it all went down. The debates over “Real Country,” and “Real Bluegrass” have gone on for generations, and likely will into the foreseeable future and beyond. This is not inherently a good or bad thing but rather a reality that fans will have to grapple with and think about on their journeys. On this night at the Palace, tradition was simultaneously upheld and thoughtfully subverted, making for one of my favorite nights of live music in recent memory.